It is a connection from one web resource to another.A link has two ends,An anchor and direction. The link starts at the “source” anchor and points to the “destination” anchor, which may be any Web resource such as an image, a video clip, a sound bite, a program, an HTML document or an element within an HTML document. Links are specified in HTML using the “a” tag. the destination address of the link used. is the visible part of the link. An internal link is a type of hyperlink whose target or destination is a resource, such as an image or document, on the same website or domain. An unvisited link appears underlined and blue in colour by default. A visited link appears underlined and purple in colour by default. An active link appears underlined and red in colour by default. 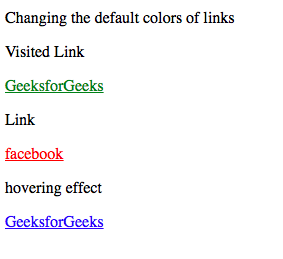 The appearances of links can be changed by using CSS. An image can be used to create a link to a specified url. A bookmark is a link that can be used to jump to specified portion of a webpage.Bookmarks are very useful if a webpage is quite long. 1. Using the id attribute,create a bookmark. 2. Add the specified portion of the webpage to the bookmark. A text link of a pdf,doc or zip file can be created to make it downloadable.